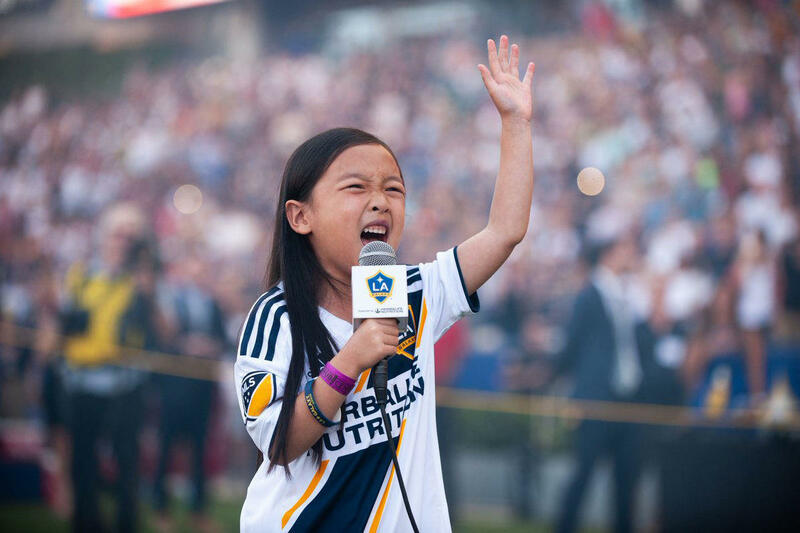 Malea Emma Tjandrawidjaja, 7, sings the national anthem on Sunday night at a LA Galaxy soccer game. Introduced as "tiny but mighty," 7-year-old Malea Emma Tjandrawidjaja stepped up to the mic before an LA Galaxy soccer match Sunday night and belted out a version of the national anthem that stunned the crowd of 25,000. "I was thinking that I cannot do anything wrong because it's a really special song to America," the 3-foot-9-inch youngster told ABC News. Malea Emma said she didn't know she would be performing at the MLS match in Los Angeles until last week. The Galaxy held a contest on social media to find someone to sing the anthem, according to ABC — and when Malea Emma's father told her she had won, she was overjoyed. The little girl with the big voice has wanted to sing since she was 1 and started lessons when she was 3, according to The Washington Post. "She's been singing forever, basically before she could speak," her father, Arman Tjandrawidjaja, told USA Today. "Sometimes we have to tell her to be quiet." She also acts, models and has amassed an Instagram following of more than 22,000. Malea Emma has several videos posted on her website, including performances of Aretha Franklin's "Think" and Radiohead's "Creep." In July, the Los Angeles native was in a Hollywood Bowl production of Annie as Molly, the protagonist's best friend. The Los Angeles Times praised her performance: "The youngest cast members stole hearts right and left on Friday, notably 7-year-old Malea Emma Tjandrawidjaja, a comic spitfire." Following Sunday's performance, Malea Emma says she has one goal on her bucket list. "After all the interviews on TV today," she tweeted, "now everyone knows that my only wish is to sing with @xtina. The question is...Does Christina Aguilera know? Hopefully..."